A Japanese prospective multi-institutional feasibility study on accelerated partial breast irradiation using interstitial brachytherapy was performed. The first clinical results were reported with a median follow-up of 26 months. Forty-six female breast cancer patients with positive hormone receptors and tumors ≤3 cm, pN0M0, completed the protocol treatment. After breast-conserving surgery and histological confirmation of negative surgical margins and pN0, brachytherapy applicators were implanted either postoperatively (n = 45) or intraoperatively (n = 1). High-dose-rate brachytherapy of 36 Gy/6 fractions was delivered. All clinical data were prospectively collected using case report forms and the Common Terminology Criteria for Adverse Events ver.3.0. At the median follow-up of 26 months, no breast cancer recurrence of any type was observed. Sequelae ≥G2 were dermatitis (G2, 7 %), fibrosis (G2, 11 %; G3, 4 %), fracture (G2, 2 %), pain (G2, 7 %; G3, 2 %), and soft tissue necrosis (G2, 6 %). Cosmetic outcomes evaluated by excellent/good scores were 100 % at pre-therapy (n = 46), 94 % at 12 months (n = 46), and 81 % at 24 months (n = 36), respectively. Disease control and sequelae were satisfactory due to the strict eligibility and protocol-defined treatment parameters. 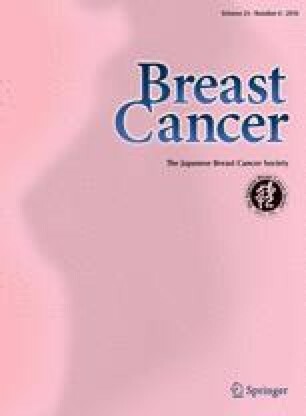 The cosmetic outcomes were comparable to those of previous Japanese breast-conserving therapy series. This study was supported in part by Grants-in-Aid for Cancer Research from the Ministry of Health, Labour and Welfare of the Government of Japan (17-10 and 21-8-2) and also by the Project for Development of Innovative Research on Cancer Therapeutics (P-DIRECT) from the Japan Agency for Medical Research and Development (AMED). NSABP protocol B-39/RTOG protocol 0413. A randomized phase III study of conventional whole breast irradiation (WBI) versus partial breast irradiation (PBI) for women with stage 0, I, II breast cancer. http://rpc.mdanderson.org/rpc/credentialing/files/B39_Protocol1.pdf. Accessed 10 July 2012. European brachytherapy breast cancer GEC-ESTRO working group. Phase III multicenter trial. Interstitial brachytherapy alone versus external beam radiation therapy after breast conserving surgery for low risk invasive carcinoma and low risk duct carcinoma in situ (DCIS) of the female breast. https://www.apbi.uni-erlangen.de/outline/EUROPEAN_BRACHYTHERAPY_PHASE_III_Trial_final_Edition_2004.pdf. Accessed 10 July 2012.